Cryptosporidium and the water industry - What is Crypto? Cryptosporidium in the water industry – what is Crypto? Recently we wrote about 5 common water industry bacteria and the result if these nasty little pathogens were able to get into our water supplies. Related content: 5 common water industry bacteria; what are they and ho do they affect us? Cryptosporidium or “Crypto” is a word that strikes fear into the hearts of water professionals worldwide. The first reported outbreak of waterborne human cryptosporidiosis occurred in the United States in 1984, and since then, numerous outbreaks involving hundreds of people have been identified in several parts of the world. In 2017 in the UK, United Utilities were ordered to pay a £450,000 fine in addition to £18.3m already paid out in voluntary compensation to consumers, as 750,000 people were left without water in Lancashire in 2015 due to a Cryptosporidium infection originating from a single reservoir. National stories like this mean that the general public and not just people in the water industry are now familiar with and worried about these problematic protozoa. The largest recorded Cryptosporidium outbreak occurred in 1993 in Wisconsin, USA, in which around 400,000 persons were infected with Cryptosporidium oocysts by drinking water from a single water treatment plant. More recently in 2010 approximately 27,000 (≈45%) inhabitants of Östersund, Sweden, were affected by an outbreak of cryptosporidiosis. Recent work has identified Crypto as one of the major causes of moderate to severe diarrhoea in children <5 years of age in low-income countries and it is likely that Cryptosporidium is a massive unreported issue in the developing world. What is certain is that Cryptosporidium spp. are the predominant protozoan parasites causing waterborne outbreaks worldwide and it is a problem that is not going away (an increase in Cryptosporidium infections, particularly by C. hominis IbA10G2, was reported in Europe this decade). 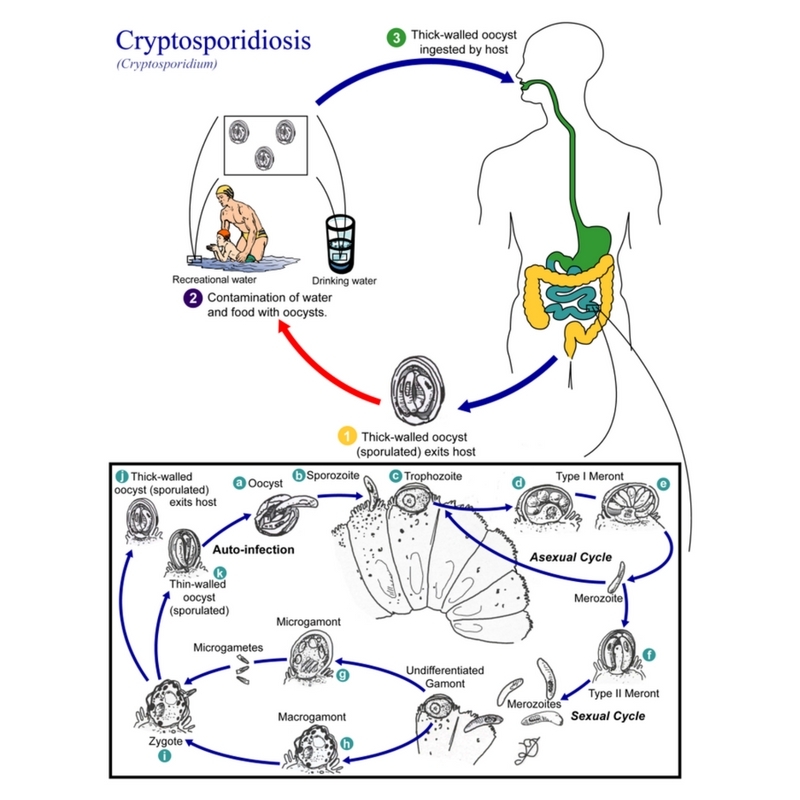 Cryptosporidium or more commonly known as “Crypto” is a waterborne parasite that causes the infected person or animal to catch the disease cryptosporidiosis, experiencing severe diarrhoea. The Cryptosporidium oocyst consists of an exterior tough shell, enclosing infective sporozoites. While exposed sporozoites are readily killed by relatively weak disinfectants, the outer shell confers excellent protection and resistance to most disinfectants. The oocysts are excreted in large numbers in faeces and can survive for months in the environment. The incubation period is 1-12 days and infection presents with diarrhoea, abdominal pain, and vomiting that can last for 3- 14 days. It was previously thought that Cryptosporidium parvum was the only species infectious to humans however Cryptosporidium hominis has also been shown to infect humans. It is these pathogens therefore that must be tackled if the disease is to be effectively managed. How do you catch cryptosporidiosis? Directly from another person or animal by touching faeces i.e. changing nappies and not washing your hands and the inadvertently putting your hands to your mouth. What are the symptoms of Cryptosporidium? How is Cryptosporidium controlled by utility companies? Cryptosporidium is highly resistant to the world’s most commonly used disinfectant; chlorine. This is one of the key reasons the pathogen poses such a worldwide problem. Research has shown that the amount of free chlorine required to deal with Cryptosporidium in drinking water is huge. Studies suggest that a level in excess of 7,000 mg/l is required to provide a reasonable reduction in the pathogen and the total inactivation requires 24 hours at 8,000-16,000mg/l free of free chlorine. This extremely high level of chlorine makes the process uneconomical and often essentially pointless as the water can no longer be used for the relevant activity. Ultraviolet light is a physical process that does not rely on the use of chemical additions. It has been shown to be effective in the inactivation of protozoa (viruses remain the most resistant), it requires relatively short contact times and does not appear to create disinfection by-products. On the other hand, there are noticeable differences in output amongst various types of UV lamps, reactor design and scale-up issues, it is very difficult to measure the lamp dose in practice, turbidity heavily affects performance and the technology provides no lasting residual disinfection effect meaning it often needs to be used with another disinfectant anyway. Ozone was first used as a disinfectant of drinking water in France almost 100 years ago. It has a broad range of antimicrobial activity, produces less conventional disinfection by-products and ozone generators can treat high volumes of water. The disadvantages of ozone is that it can produce bromate as disinfection by product if the water has bromide in it, there is no mid to long term residual disinfecting effect and it is highly affected by temperature with a reduced efficacy in cold water. Related content: What is ESOL Electrolyzed water? ESOL electrolyzed water is generated through the electrolysis of a low salt solution within an electrochemical cell which can be configured to produce solutions of varying strength and properties. ESOL electrolyzed water has been shown in numerous scientific publications to be extremely fast acting with broad spectrum antimicrobial activity (including bacterial spores and fungi). Additional benefits of the use of ESOL include in situ generation from inexpensive raw materials (salt and water) coupled with the solution being completely safe to the user and fully biodegradable. Numerous studies have demonstrated the efficacious effect ESOL electrolyzed water has on Cryptosporidium parvum oocysts. In a landmark study ESOL was matched with chlorine in terms of free chlorine and performance inactivating Cryptosporidium and Clostridium was compared. A 5 mg/l dose of ESOL produced a > 3 Log10 (> 99.9%) inactivation of Cryptosporidium parvum oocysts (and Clostridium perfringens spores) in 4 hours. In comparison, free chlorine alone had produced no measurable inactivation of Cryptosporidium parvum oocysts by 4 hours or 24 hours. ESOL technology is sold commercially in the water industry and with the benefits over competitor technologies the ESOL liquid brings and academic results achieved ESOL has emerged as an excellent tool for controlling Cryptosporidium in water. All this being said, when I turn on a tap in the UK I am almost 100% confident that the water coming out of it is clean and safe to drink. I feel this way because I have learnt that all drinking and waste water is required to go through a water disinfection process. It is critical to public health to ensure all chemical, solids, contaminants and bacteria are removed to safe guard humans and animals. Waste water is required to be treated in order for it to be safely returned to the environment. L.V. Venczel, M. Arrowood, M. Hurd & M.D. Sobsey. (1997). Inactivation of Cryptosporidium parvum Oocysts and Clostridium perfringens Spores by a Mixed-Oxidant Disinfectant and by Free Chlorine. Applied and environmental microbiology.63: 1598–1601.